The Stacy collection by Jennifer Taylor Home aims to add some functional storage space to the entry way, living area or bedroom. The unique storage bench design features a removable and comfortable seat cushion. The Stacy is upholstered with high quality fabrics and the wood frames are made from kiln dried birch wood which provides exceptional support and stability. 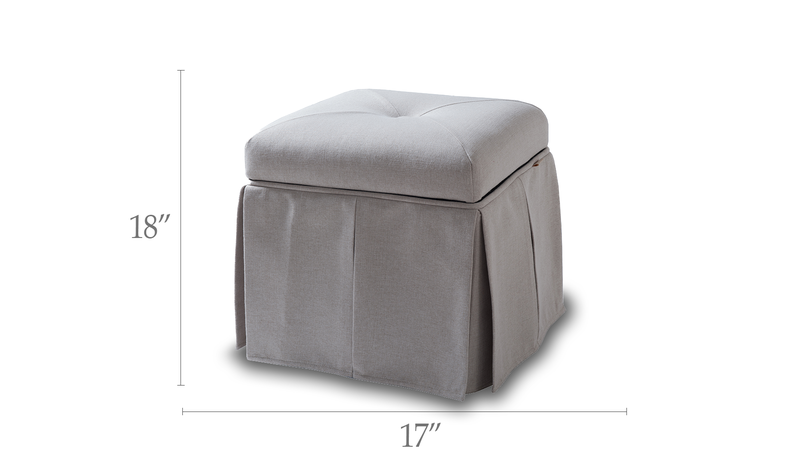 Crafted beautifully with a single hand tuft on the lid and pleated skirting, this storage cube brings class and lounging comfort to any room in the home, whether it’s used as a footrest or additional seating for guests. We offer a unique versatility in design and make use of a variety of trend inspired color palettes and textures to bring new life to any home. I was looking for this exact size to fit under my vanity... I took one star away because the top falls off easily after sitting on it. Other than that happy with my purchase. Well made and attractive- provides vanity table seating with storage in a small guest room. All I had to do was unwrap and pop the top on.